With a name like this you can’t miss it: black metal the underground way! It is too bad that the disc I received is seriously fucked up, as it kind of disturbs the ferociousness of their music. The band started out in 1999 and this is their second demo (and attack on Christianity). The demo opens with intro ‘Re-invocation Of The Hordes’; skip that one, as it does not add anything special to the demo. The good thing is that the 5 songs offer a sound alternative to those who believe Marduk is not Marduk anymore since their early days and releases. And Enthroned must have had its influence; yet it is too easy to compare a Belgian band right away with these forefathers of the Belgian underground. 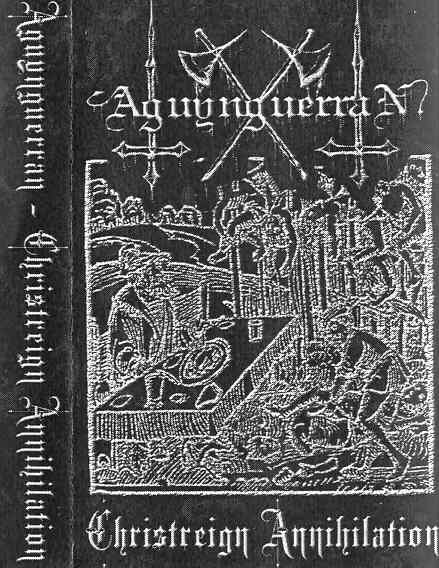 AguynguerraN’s philosophy is quite simple: it must be fast and filled with hate, with guitar riffs screaming straight out of the pit! On the other hand, they also know the secret of bridge arrangements to avoid it becoming all just one speed blur. The sound is rather good; though they operate from dark dungeons, they have taken the trouble of at least recording the music in a decent way, so that we can keep all the instruments and vocals apart.